The Holy Martyr Tryphon the Wonderworker, who was martyred in Lampsakos of Asia Minor in the third century, is celebrated by Orthodox Christians annually on February 1st. 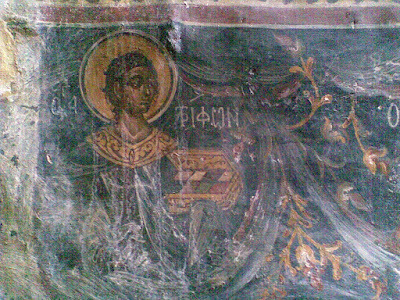 Many monasteries in Greece today have portions of his holy relics, which are a source of numerous miracles to those who flee to Saint Tryphon with faith. Among these is the Holy Monastery of Xenophontos at the Holy Mountain, where his skull is kept. 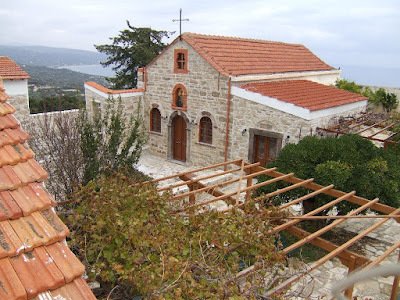 And churches and monasteries throughout Greece have been built in his honor, among which is a monastery in his name on the island of Chios in the village of Nenita that was founded in the seventeenth century. Besides his many miracles through his relics, Saint Tryphon is beloved by the people because he is the patron of vinedressers and farmers. One reason for this is because in February the vines are pruned. Vinedressers therefore take the day off work in honor of the feast in order to attend a Sanctification of the Waters service, after which they sprinkle their vines with holy water. A prayer is also read from the Euchologion by the priest to Saint Tryphon specifically for the vines. There is a rich hymnography dedicated to the Saint. Services that have been published in his honor date to 1853, 1911 and 1923 in Athens, to 1855 in Syros, to 1871 in Kerkyra, to 1899 in Tripoli, to 1911 in Patras, and to 1908 in Smyrna. Monk Gerasimos Mikragiannanites composed a Service in his honor and published it in 1957 in Volos. We also have a complete Service of Praise, with a Paraklesis and Akathist, that was written by Saint Nikodemos the Hagiorite.